Fill a large pot or cocotte with water, bring to a rapid boil, and salt generously. Stun and drop the lobster head first into the boiling water. Cover and cook for approx. 5 - 8 min. Meanwhile, peel and chop the carrot, shallots, and garlic cloves. Transfer to a bowl and set aside. Transfer the lobster to another pot and cover with cold water to stop the cooking process. Once cool enough to handle, transfer to a cutting board. Remove the tail. Remove the claws. Discard any remains and save the shells in a separate bowl. Remove claw meat. Remove tail meat and set aside. Cut off legs and add tail to saved shells. If it's a female lobster, scrape out the red coral (roe) and set aside. In a fresh pot or cocotte, heat half the olive oil over medium-high heat. Add the carrot, shallots, and garlic. Sauté for approx. 1 min. Stir in the lobster shells, thyme, bay leaf, parsley, and tomato paste. Add the tomatoes and wine and season with Piment d'Espelette, salt, and pepper. Cover and cook for approx. 20 min. over medium heat. Stir in the sour cream and reserved roe, should you have had a female lobster. Reserve and rinse lobster head and tail for plating. Salt to taste. 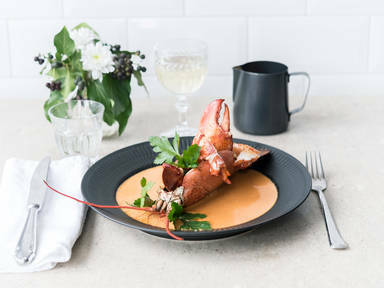 Remove the lobster-vegetable mixture from the heat and strain through a sieve into a clean pot. Remove as much liquid as possible and discard solids. Set pot over low heat and reduce into a thick sauce, whisking occasionally. Meanwhile, set a frying pan over medium-high heat. Add the remaining olive oil and fry lobster tail and claw meat for approx. 1 min. on each side. Season with Piment d'Espelette. Plate lobster shell and fill with parsley. Add lobster meat and season with more Piment d'Espelette to taste. Add bisque sauce. Enjoy!